AP-300 combines the features of static and kinetic parameters, offering a rich set of diagnostic techniques. Advanced application software provides unique functions analysis of patient results, making diagnosis easier and earlier. 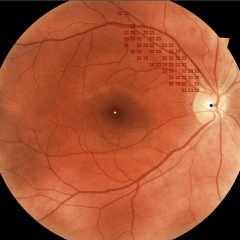 Standard presentation of patient results allow the user to print a single test and present clinical changes in the visual field over time. Kinetic perimetry is performed using stimuli of varying size, color, intensity and speed of movement (according to the standard adopted for kinetic perimetry). A single test can consist of up to 8 Isopters. For each isopter, individual stimuli parameters can be assigned, which broaden and enhance diagnostic range, enabling an improved clinical assessment. 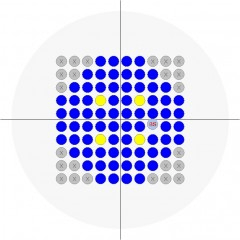 Static perimetry Blue-On-Yellow, presented by blue stimulus size V by Goldmann on a yellow background, enhances earlier diagnosis of glaucoma. 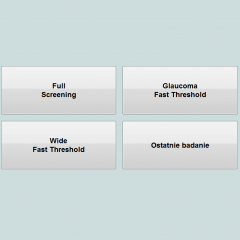 A rich library of built-in test fields and strategies improves accuracy of diagnosis and documents changes in the field of view of the patient over time. AP-300 can perform tests using static stimulus of different size and color. The stimulus can vary from size I to V according to Goldmann standard for white, blue, green or red. By default, the proposed stimulus is white III. 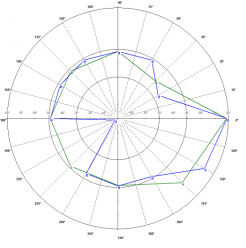 Tests can be performed within standard testing area covering various ranges of angular field of view (up to 80 degrees for one eye). 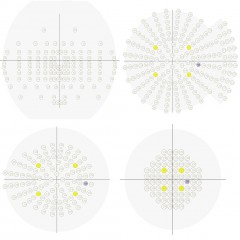 There are fields with concentric arrangement stimuli (i.e. 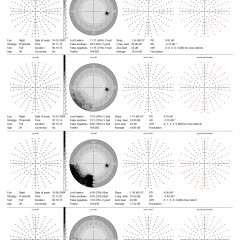 Macula, 22 °, 30 °, 50 °, driving Wide, Glaucoma, Peripheral) or the rectangular system (i.e.. 10-2, 24-2, 30-2). The built-in editor allows the user to define specific tests of the test field. It is also possible to test the central vision (optional Fovea). 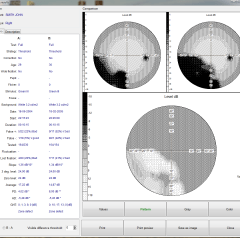 The unique technology targeted perimetry allows the user to load previous fundus images and select area requiring investigation, and the perimetry examination will be focussed on the designated area. 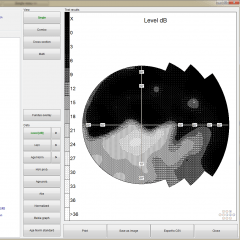 This technology allows for faster and more accurate examination of the area of interest. 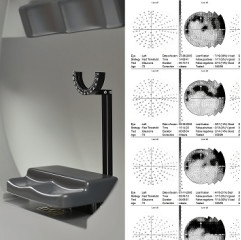 Patients with large defects in the visual field or fields significantly deviating from the standard perimeter examination, can experience fatigue due to length of the examination. Pattern calibration is designed to improve the comfort of these patients and significantly reduces examination time. Pattern calibration technique can reduce examination time significantly by more than five minutes. AP-300 can be used in both small offices and large clinics. With built-in networking capabilities, installation of the device is very easy with system expansion economical. AP-300 can easily communicate with devices connected directly or network printers and servers. 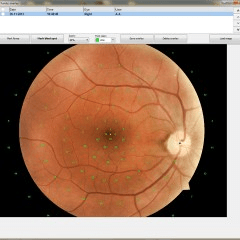 Perimeter software can be installed on any number of computers, allowing users to organize efficient and effectively patient workflow across any clinical practice. 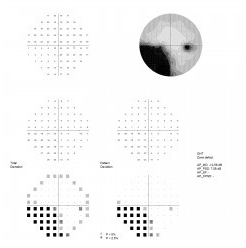 The resulting sensitivity of the field of view can be presented in many forms, including numerical gray scale, scale, color, scale, dot or a three-dimensional map. Presentations can represent absolute values in decibels, hill view, deviations from the standard age and curve defect (Bebiego). 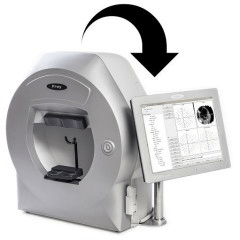 AP-300 software allows the user to print the results in the form of a standard map 7 in 1 (7 result presentation on one side), or other formats are available for user preference and editing. 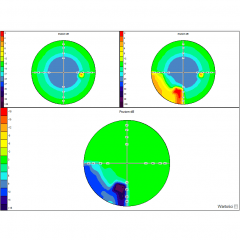 Strategies include fast screening (Screening, Neurological), accurate strategies threshold (Threshold, Fast Threshold, Smart Threshold) and a number of additional strategies (Constant, Zone 2, Zone 3, Quantify Defect, Binocular, strategies binocular drivers). Accuracy and clinical relevance of the results of the examination can be significantly affected by patient fatigue. 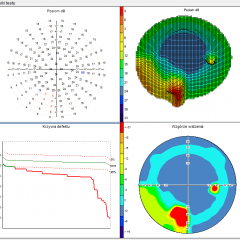 AP-300 software is complemented by advanced algorithms to allow to shortened examination times while maintaining accuracy and clinical relevance. 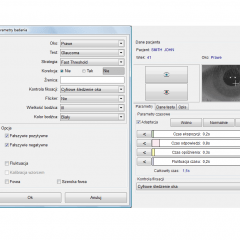 Accuracy of the examination is controlled by parameters such as exposures false positive, false negative exposure, verify the position of the optic disk method Heijl-Krakau method or automatic control of fixation (digital tracking of the eye). Additionally, adaptive adjustment of the speed of stimulus presentation, depending on the patient’s response can be optioned and implemented by the user which can significantly improve the clinical examination. 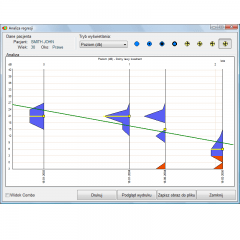 Easiest method to visualize changes between two examination results of a patient is Compare function available from the software. Differences between recorded values may be presented in many ways. 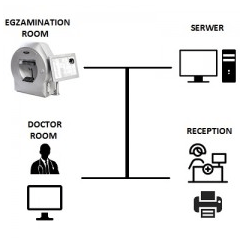 You can migrate easily examination data to AP-300 from HFA device. 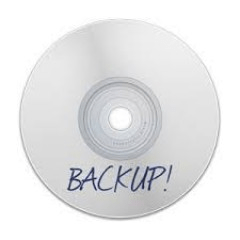 Import function accepts files stored in .xml and .pdf formats.